Thanks to all that came to Party at Sumac on Satuday 18th October 2014. See more Pics and all the news that’ fit to print on our Party Diary Listing! 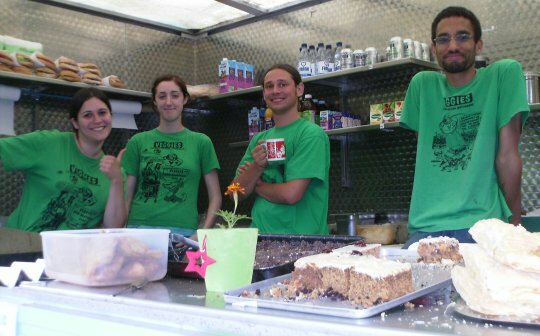 To mark 70years of @TheVeganSociety we'll have catered 70 events by our 30th anniversary on Saturday http://t.co/OT30WN6ZBu Join us & party! 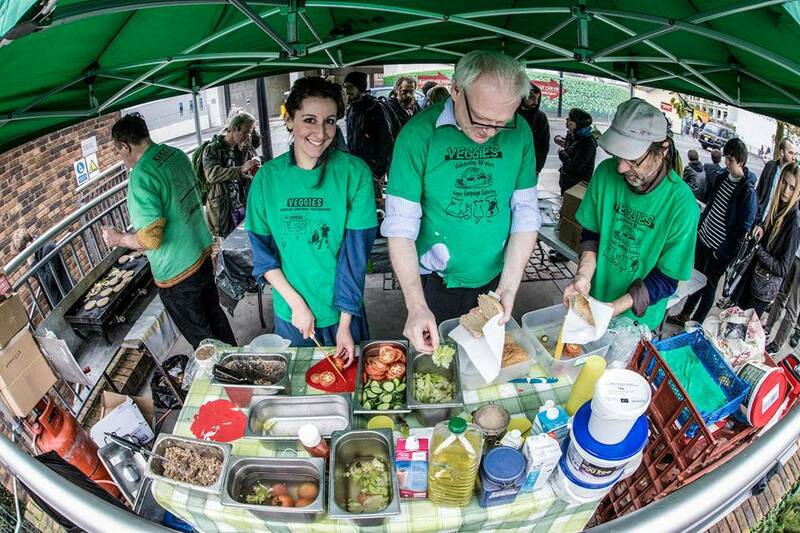 By the date of our 30th Anniversary in 2014 Veggies catered 70 events to mark 70 years of the Vegan Society! The Vegan Society was founded in November 1944 and we’ve made tremendous of progress since. 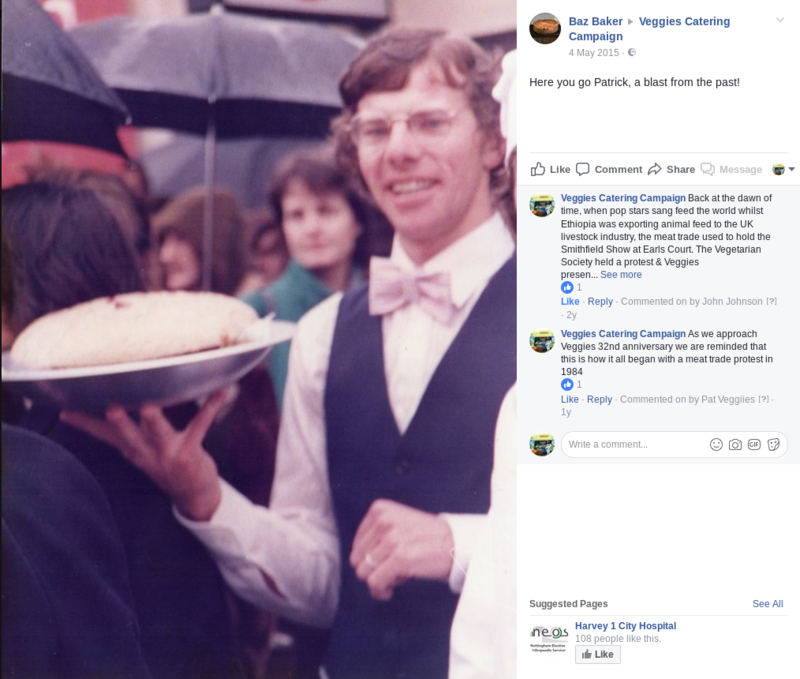 When Veggies first hit the streets of Nottingham in 1984, vegetarian were still seen as cranks and vegans were from another planet! Partly due to our work, and that of the Vegetarian and Vegan Societies, vegetarian food is mainstream and Vegan widely understood. Indeed it is reported that there are more google searches for “Vegan” than vegetarian, and more books published with Vegan in the title! 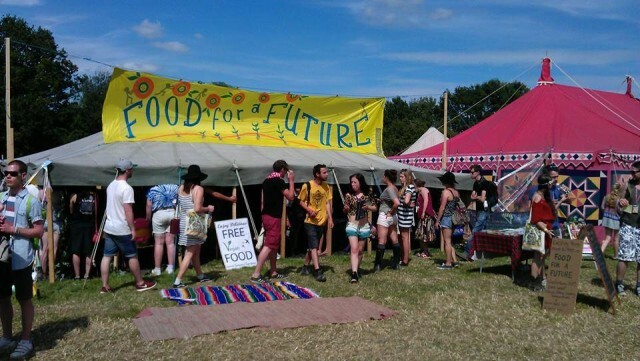 Veggies continues to support this major social change by taking accessible and popular catering to some 70 events each year – from campaign rallies to community festivals, from family celebrations to green gatherings. We offer tasty, wholesome snacks, as well as information exploring the links between diet, animal suffering and the environment. Read about the history of veganism – far more than just 70 years – at the new Vegan Society website. Pedals was founded in 1979 to encourage more people to use bikes and to campaign for safer and more attractive conditions for cyclists in the Nottingham area. 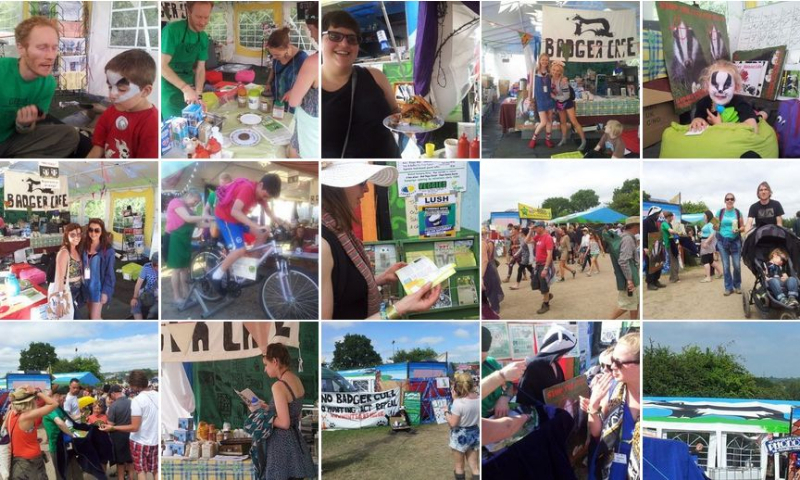 Pedals has helped to get Nottingham one of the country’s largest network of urban cycle routes, making it possible for Veggies to cater smaller local campaign events by bike & trailer. 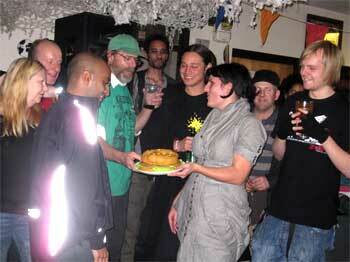 What better way to celebrate 35 year on the streets, than with Veggies Cake! For more information on Pedals achievements since 1979 visit the History of Pedals pages. A decade of monthly meetups! 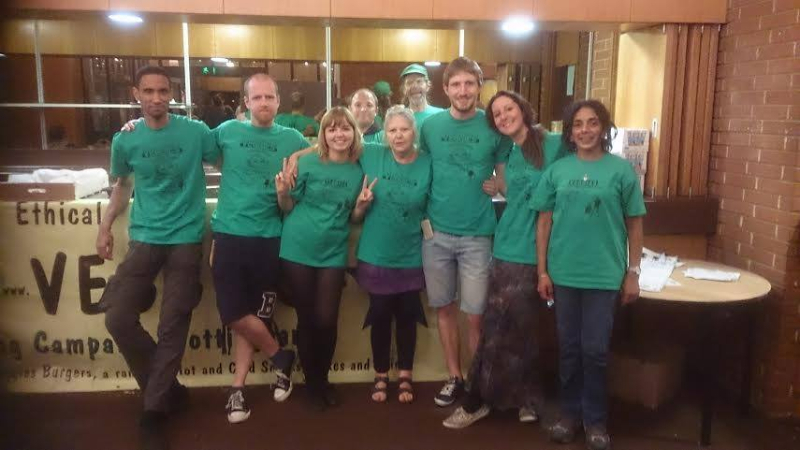 @veggiesnottm @Veganniversary @TheVeganSociety This year is the 10th anniversary for @ManchesterVegan Society! A decade of monthly meetups! Ever since 1984 Veggies has aimed to be the most ethical company that we could be. This aim suddenly became a real possibility when the Ethical Consumer Research Association was launched 25 years ago. Veggies strives to be an ethical, wholefood supplier and stock only vegan food, with a preference for fair trade and/or organic where appropriate. Many of our customers share our concern to help animals, people and the planet. We therefore have rigorous guidelines to help us avoid paying for goods and services which are known to cause harm, suffering and destruction. This has been guided by Ethical Consumer since the publication of issue #1 of the magazine in March 1989. Read more about this journey & see examples of our purchasing decisions. When Juliet Gellately founded Viva! back in 1994, she promised that they would campaign non-stop to save animals’ lives, in whatever way was most effective, to the very best of their ability. We have shared that work and with your support, Viva! (and Veggies) have helped many people go vegetarian and vegan, thus saving thousands upon thousands of animals’ lives. 15 years ago the first products bearing the FAIRTRADE Mark hit the shelves. In 1994 Green & Black’s Maya Gold chocolate, Cafédirect medium roast coffee and three varieties of Clipper tea (all stocked by Veggies) were the first goods sold in the UK to carry the FAIRTRADE Mark. By that time Veggies Catering Campaign had already spent 15 years using nothing but Fair Trade teas & coffees, ever since day one, sourcing (and distributing) it from pre-existing projects such as Tradecraft. Thanks to its supporters, the Fairtrade movement has gone from strength to strength and today shoppers can choose from more than 4,500 Fairtrade certified products including cotton clothing, bananas, wines, ice-cream and cosmetics. Follow the 15th Anniversary news on the Fairtrade Foundation website. Hunt sabs from across the South celebrated the 50th anniversary of the Hunt Saboteurs Association (HSA) (on Saturday 18 January 2014) by converging on the South Devon Foxhounds at Dartmoor. The hunt saboteurs can claim to be the longest running direct action organisation in the UK and have given many an activist their first taste of direct intervention. The South Devon was the very first hunt the HSA disrupted, all the way back in 1963, using horn calls, sprays and even discarded meat to distract the hounds! Read all about it at SchNEWS and on the HSA website. On April 20th 2014: It is nineteen years since live animal exports resumed from Dover, with the exporters using their own ships after the ferry companies had banned them in 1994. They had been running out of Shoreham since the end of 1994, but that was unsustainable as the geography of the place made it that there had to be 1,000 police officers every day to get the transporters to the port. Since those heady days when Veggies were regulars at Shoreham, Dover and Coventry Airport, we continue to support the campaign, listing the regular First Saturday Monthly protests on our Animal Rights Calendar, as well as the KAALE vigils, which are held whenever there is a sailing of live animals from Dover. Donations may be sent to support the work of KAALE via either of these pages. We also remember that January 15th 2014 should have been the 50th birthday of Jill Phipps whose life was so tragically taken whilst campaigning to protect veal calves heading for continental Europe via Coventry Airport. Tuesday 1st 2005 was the 10th anniversary of the tragic death of the dedicated animal rights activist, Jill Phipps. As most people will be aware Jill campaigned tirelessly for animals in Coventry (her home town) and across the country. It was was whilst protesting against live exports at Coventry Airport that she died under the wheels of an export lorry. 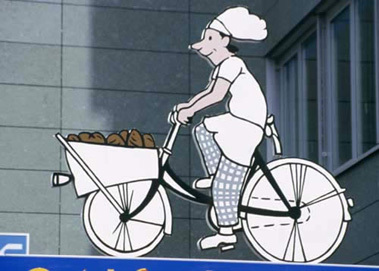 In fact Arthur Ling formed Plamil to market The Milk of Human Kindness in 1965! 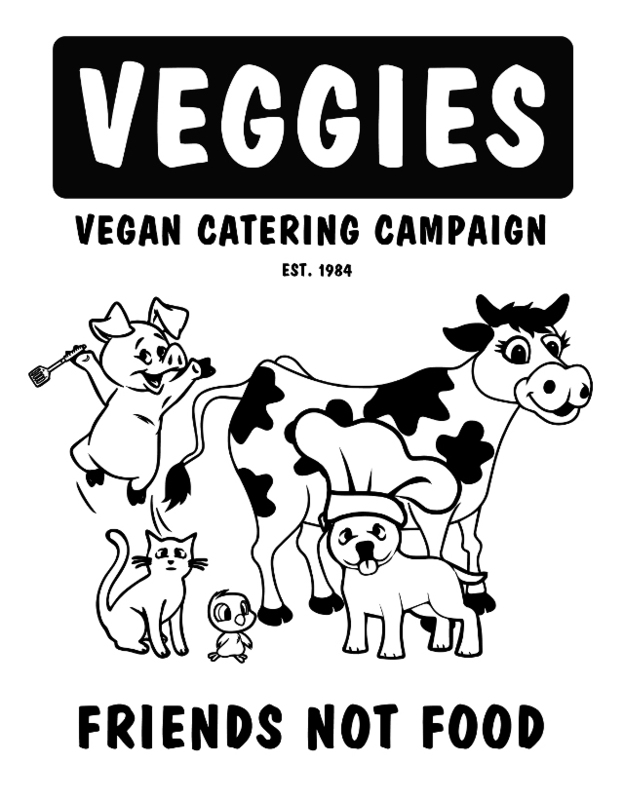 The founders of Veggies hatched their plans at meetings of Nottingham’s Vegetarian Society and Nottingham Animal Rights Group in 1984. 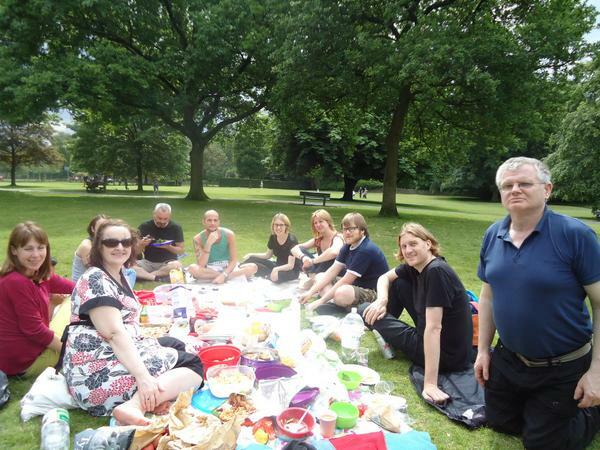 Between then and now Nottingham Vegetarian & Vegan Society merged with Veggies, becoming the centre of Vegetarian & Vegan activities in Nottingham. 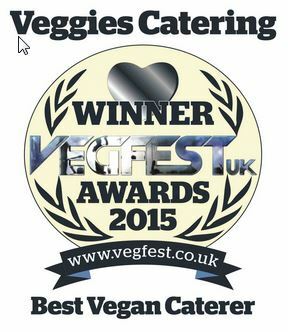 Veggies is now the formal Local Group of the Vegetarian Society of the UK as well as an accredited member of the ‘VegSoc Approved’ Food & Drink Guild. We particularly remember David Lane, a stalwart support from the start, who we sadly lost this year. 30th Anniversary Year and the 70th Anniversary of the Vegan Society. 14/8’14: Reclaim the Power Sorry, we couldn’t make it. 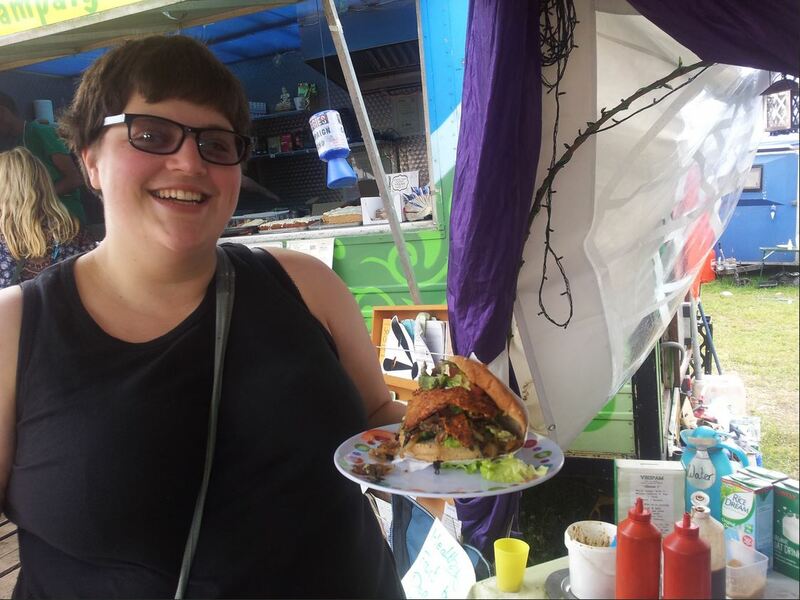 70 Event Target Achieved – 82 events catered in 2014!